Whether you are stuck inside due to hot temperatures outdoors or you are snuggled up on the couch in the chilly months of winter, crocheting sunflowers may be just the project for whiling away the hours. This sunflower is a simple and quick project suitable for a beginner to crochet. Tuck this pattern into your yarn stash as a go-to project for craft busting. It's a great way to use up all those leftover yarn balls from previous projects. The yellow yarn can be substituted with shades of red, orange and gold. Embellish the flower centers with seeds. The seeds can be embroidery floss, lazy daisy stitches, beads, buttons, sequins or snaps. Note: If you will be using the sunflowers as coasters, do not attach buttons, beads or snaps. Experiment with different yarn weights and hook sizes for larger or smaller sunflowers. 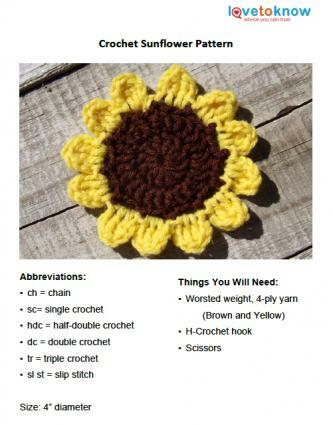 For more crocheted sunflower patterns, try these project options. If you're looking for a bigger bang for crocheted sunflowers, make an afghan with a collection of granny square sunflowers using the pattern at Purple Chair Crochet. This is an easy pattern that employs basic stitches. When thinking of crochet materials, crochet thread and yarn seem like the obvious choice, but According to Matt has an awesome dimensional sunflower that is crocheted using embroidery floss. While the stitches are basic, this intermediate project would be more suitable for a crocheter with experience working with thread and tiny crochet hooks. Your child will love being the stem to this adorable crocheted sunflower hat created by Oui Crochet. This is another intermediate project that you can complete in a few hours. These crocheted sunflowers are just the right size to be used as coasters or use as appliques to add to hats, purses and jackets. Make them to give as gifts or to sell at fall craft shows.